Provide targeted mathematics instruction for every child. 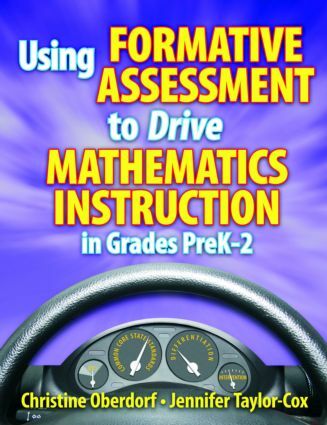 These books combine formative assessment with practical activities to differentiate the elementary classroom. The formative assessments include student work samples at varying levels. The authors…Illustrate the distinction between a "traditional" assessment and an "enhanced" assessment. Describe specific differentiated activities so each student may consistently receive instruction geared to specific need. Provide teachers with "Questions to Assess" to determine what each child understands about the math concept. Show how to move students to higher-level mathematics thinking and to apply math concepts. Include extension activities to offer challenging work for children who have achieved skill mastery level. Each activity states a goal, the materials needed, a description of the activity, as well as specific questions to ask students. The assessments and activities are aligned with the Common Core State Standards for Mathematics and the expectations described by the National Council of Teachers of Mathematics. This resource will help teachers, principals, and curriculum directors identify students' levels of understanding about mathematics and provide concrete resources for remediation, instruction, and enrichment. These books are also an excellent resource for use during workshops and in-class observations. Provide targeted mathematics instruction for every child. These books combine formative assessment with practical activities to differentiate the elementary classroom. The formative assessments include student work samples at varying levels. The authors… Illustrate the distinction between a "traditional" assessment and an "enhanced" assessment. Describe specific differentiated activities so each student may consistently receive instruction geared to specific need. Provide teachers with "Questions to Assess" to determine what each child understands about the math concept. Show how to move students to higher-level mathematics thinking and to apply math concepts. Include extension activities to offer challenging work for children who have achieved skill mastery level. Each activity states a goal, the materials needed, a description of the activity, as well as specific questions to ask students. The assessments and activities are aligned with the Common Core State Standards for Mathematics and the expectations described by the National Council of Teachers of Mathematics. This resource will help teachers, principals, and curriculum directors identify students' levels of understanding about mathematics and provide concrete resources for remediation, instruction, and enrichment. These books are also an excellent resource for use during workshops and in-class observations.